I have an application without keyboard shortcuts where I have to do a recursive work, in practice I have to insert fields with keyboard and click the mouse button over the OKbutton so I have to switch between keyboard and mouse very often only to click without moving the mouse. I know that in System Preference->Acessibility I can enable mouse keys but if I have to press altfive times before I can use the mouse and then I can't no more type with the keyboard until I disable the mouse keys I lose more time then the first solution. Put the mouse in the floor and press the button with the foot's finger is an alternative but other users may not approve it. 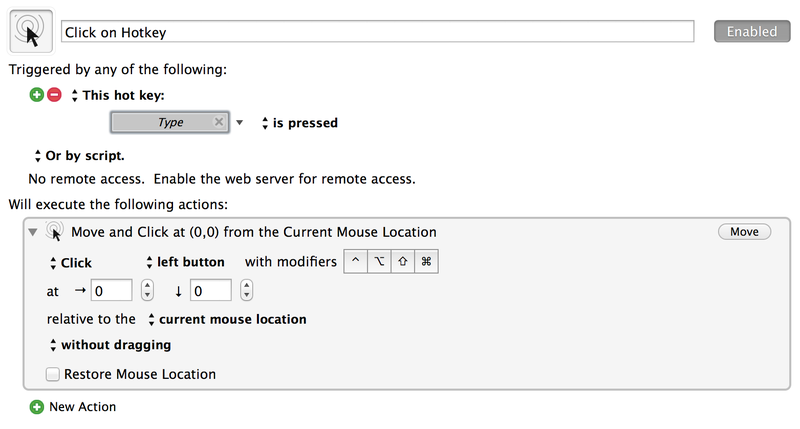 How can I set a quick short-cut for clicking with mouse pointer from keyboard in mac Mountain Lion? Not the answer you're looking for? Browse other questions tagged mountain-lion keyboard mouse shortcut-menu . How do you make a keyboard shortcut for clicking at a certain point?